baseball in "Trouble With the Curve." 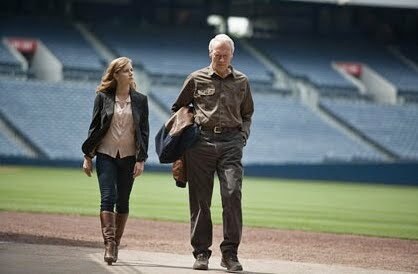 Clint Eastwood is back in grumpy old "Gran Torino" mode as a cigar-chomping baseball scout who is losing his eyesight in the strictly minor league "Trouble With the Curve." Never an actor with much depth, the chair-chastising curmudgeon does a sitcom-adequate job of pitching peevishness and lobbing sarcasm, but bobbles scenes requiring remorse and vulnerability. Weathered widower Gus Lobel (Eastwood) has spent his life on road trips and poring over paperwork statistics about players, having no use for new-fangled computers, the "interweb" and such-like modern-day foolishness. "Trouble With the Curve" is the anti-"Moneyball" in that regard, making a backstabbing tech-savvy whippersnapper (Matthew Lillard) come off as hopelessly clueless about the real world. The screenplay by first-timer Randy Brown tries to touch as many emotional bases as possible by dealing with mortality, abandonment, betrayal and shame on its way to the comforting dugout of reconciliation. Eastwood gets in a can't-win pickle when Gus is required to have an embarrassing heart-to-heart and a beer with his dead wife's gravestone that ends with him singing "You Are My Sunshine." And an eventual shocking revelation from Gus that should be an impressively painful slide into home comes up short because Eastwood doesn't put enough heart into the effort. Amy Adams fares better in a bad role as Gus' estranged daughter Mickey (named after Mantle), a stereotypical asexual workaholic who finds true love and the meaning of family when she finally lets herself unclench. Naturally, this means Mickey cheerfully will toss her ringing Blackberry into a Dumpster by the final reel, as all enlightened career women do. Gus' vision problems cause him to trip over his coffee table, give a delivery boy too much money and run into the side of his garage, but the movie is inconsistent about his infirmity. He somehow makes the entire drive from Georgia to North Carolina without incident, apparently so the movie can put him behind the wheel there for a later accident. He also is able to recognize Mickey approaching his bleacher seat from a considerable distance before a game, even though he has no reason to be expecting her. Justin Timberlake is likable but miscast as a former pitcher turned scout hoping to get a broadcast-booth job. His too-youthful face and demeanor make his more than six-year age difference with Adams appear even greater. That means their relationship seems just awkward enough to inspire cougar-lite references that strangely never materialize. Also, what's supposed to be his character's bitterness over his lost playing career isn't seasoned with sufficient resignation to be credible. The almost entirely predictable plot includes the requisite difficult-urination moment for men of a certain age that's been used at least as far back as 2001's "Zoolander." A climax-foreshadowing scene that has all the subtlety of a baseball bat to the forehead is almost as shamelessly contrived as its payoff. Two of Gus' fellow old-timers, one black and one white, argue the merits of white vs. black actors in an unfunny bit that thankfully appears only twice. And viewers who enjoy driving after drinking whiskey straight from the bottle will be pleased to see that popular pastime presented here without any legal or lethal repercussions. First-time feature director and longtime Eastwood producing partner Robert Lorenz keeps most of the movie so flatly generic that a convincing crying scene and a breakfast breakdown by Adams seem as out of place as opera at a ball park. Adams' impressive performance in the infinitely superior "The Master," which is in theaters at the same time as this lightweight affair, makes it obvious she is this cast's most overqualified ringer. Her character on paper may be nothing more than the usual humorless tightass who literally has to jump in a lake to let her hair down, but Adams at least tries to give the girl some game.